Nearly every Indigenous family in Canada has been affected and the effects on communities are still with us today. Earlier this month, I stood before hundreds of people gathered at the University of British Columbia and publicly apologized for the role my university played in perpetuating the Canada’s Indian residential school system, which caused harm to Indigenous people for more than a century. Many survivors of residential schools were in the audience. As president of UBC, I was privileged to extend this apology to them along with an explanation to my university colleagues as to why the apology was necessary. My remarks were followed by those of two former residential school students and other Indigenous community respondents. The Indian residential schools operated for more than a century as a partnership between the Canadian government and major Christian churches, with the last school closing only in 1996. For much of that time, Indigenous children were forcibly removed to schools that sought to break their ties to their families, communities and culture. Many spent their entire childhoods in the schools and many died there: the mortality rates at some schools at times surpassed 60 per cent. Most suffered emotional or mental abuse. Many suffered physical and sexual abuse. Those who survived often left feeling distraught, alienated and angry. With no or limited experience of family life — and no means to address the trauma they had experienced — many transmitted the abuse they had endured to later generations. 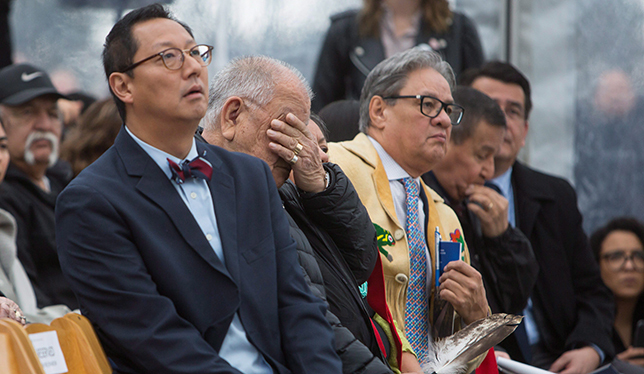 Barney Williams Jr., a residential school survivor, reacts while listening to remarks from Chief Wayne Sparrow of the Musqueam First Nation near UBC President Santa Ono, left, and Grand Chief Edward John of the Tl’azt’en First Nation during the opening of the Indian Residential School History and Dialogue Centre at UBC in Vancouver, B.C., on Monday April 9, 2018. Photo courtesy of The Canadian Press/Ben Nelms. Few Canadians are aware of this history or its lasting harmful effects. Their ignorance is no accident. Expressions of Indigenous culture were banned by Canadian law from 1885 to 1951. Only recently has significant attention been given to Indigenous history experience and perspectives in school curricula at any educational level. Universities like UBC bear part of the responsibility for this history — not only for having trained many of the policy makers and administrators who operated the residential school system and doing so little to address the exclusion from higher education that the schools so effectively created — but also for tacitly accepting the silence surrounding it. In years past, even after the signing of human rights declarations and ethics agreements that followed the Second World War, university professors conducted research on the residential schools that exploited their deplorable conditions without attempting to change them. The continuing failure to address this history has meant the previous ways of thinking — or of not thinking — about the residential school system have remained largely intact. Failing to confront a heinous history, even if it is one we did not cause, is to become complicit in its perpetuation. This photo from 1970 shows the entrance of St. Michael’s Indian Residential School in Alert Bay, B.C. Library and Archives Canada, CC BY. Some of my colleagues may note the major part of the oppression and offence of the Indian residential school system occurred generations ago. And they may ask: are we — can we be — guilty for wrongs we did not personally commit? This question is pursued in an insightful book, On Apology, by Aaron Lazare, Emeritus Chancellor, Dean and professor of psychiatry at the University of Massachusetts Medical School. His answer is twofold. First, people are not guilty for actions in which they did not participate. But just as people take pride in things for which they had no responsibility (such as famous ancestors, national championships of their sports teams and great accomplishments of their nation), so too must these people accept the shame (but not guilt) of their family, their athletic teams and their nations. Though Prof. Lazare’s argument is framed around family ancestors, sports teams and nations, it applies with equal force to educational institutions. If you take pride in being associated with UBC, as I do, then together we must accept the responsibility to acknowledge our predecessors’ failure to stop the residential school system — an act that could have reduced, perhaps even prevented, the damage done to generations of Indigenous children and communities. “A second and related rationale for people apologizing for actions they did not directly commit is that these people have profited from these actions. Imperialistic acquisition of land and the use of slave labour by a nation, for example, may continue to benefit future generations of citizens. Such beneficiaries, while not guilty, may feel a moral responsibility to those who suffered as a result of the offense”. “Such beneficiaries” includes us, the modern-day community of UBC. Throughout much of the 20th century, as UBC created educational opportunities for many Canadians, Indigenous people were largely excluded from those benefits. Worse still, thousands of Indigenous people were relegated to the residential schools, where they suffered and received, at best, a rudimentary education. We are working through programs at UBC to address the needs of Indigenous peoples. One is through education: we cannot continue to graduate non-Indigenous students who are not prepared for meaningful interactions with Indigenous peoples and communities. In the health disciplines, for instance, it is important that our graduates understand the importance of their roles and interactions, so we have been developing curricula on Indigenous Cultural Safety for inclusion across the health disciplines. The initiative is a response to two specific calls to action from the Truth and Reconciliation Commission of Canada: for cultural competency training for all health-care professionals and for medical and nursing schools to have all students take a course dealing with Aboriginal health issues. We have also recently established the Indigenous Research Support Initiative to better develop and support collaborative research relationships with Indigenous communities that ensure that research is co-developed that addresses community priorities. The new Indian Residential School History and Dialogue Centre at the University of British Columbia. University of British Columbia, CC BY. On the day of my apology, we also announced the official opening of the Indian Residential School History and Dialogue Centre. Part of the responsibility UBC bears for residential school history is in tacitly accepting the silence surrounding it. We hope to break that silence and to cut through the wilful ignorance. The centre has been built with several aims in mind. One is to offer an accessible venue on the west coast for former residential school students and survivors, their families, friends and communities to access their personal and community records and other materials gathered by Truth and Reconciliation Commission, our university and other organizations. Another aim is to provide public information to anyone who visits the centre in person or accesses its resources online. Many individuals have limited knowledge of Indigenous people or the history of their interactions with other cultures. A third purpose of the centre is to promote dialogue. We are having conversations with Indigenous leaders on such fundamental issues as Indigenous health, economic development, language and community resiliency — and the establishment of collaborative research relationships that we hope will repair the damage of past practices. While the centre is a major commitment on the part of the university to acknowledge the history of the Indian residential schools, it is by no means the only place, or the only commitment. Every action that anyone takes to move us forward is significant and there are always ways in which each one of us can act. We know, however, even as we have worked towards these goals, we have made mistakes and we cannot presume we will not make more in the future. Our commitment is to learn from our mistakes, and, together, to continue to move forward. Santa Ono is the president and vice chancellor of the University of British Columbia. Watch the full video of Dr. Ono’s speech at the April 9 event as well as the entire ceremony, including the remarks of four community respondents. There are so many inaccuracies and outright falsehoods in this piece by a supposed academic that I don’t know where to begin. That a person in Dr. Ono’s position would happily jump on the bandwagon of demonizing the Indian Residential Schools demonstrates how little faith the Canadian public can have in current media reports, academic papers and statements by Indigenous leaders and activists. The word “truth” is bandied about repeatedly, but so few people seem determined to seek it out. Just one example: Dr. Ono writes “For much of that time [the IRS period], Indigenous children were forcibly removed to schools that sought to break their ties to their families, communities and culture.” This statement gives one the impression that ALL Indigenous children were forcibly removed to IRS institutions, when in fact only about 30% of the school-age Indigenous population ever set foot in a residential school during that system’s existence. And among that 30% group, only a percentage were “forcibly removed” from their homes. The Indian Act compelled Indigenous parents to put their children in school – period. Only where the residential school was the only option did parents have the decision to obey the Act or not. And many Indigenous parents sent their children to the residential school, not because they were compelled, but because, like any parent today, they wanted their children to get an education that would prepare them for the life ahead. Over a period of 10 years, I saw this happening, saw the parents, saw the children. There was no determined effort to “break the ties with family or communities”. And many parents thanked the schools for what they were doing. It’s 2018 and ancestral sin is now back (only for some people though). A courageous step, one taken with open heart and mind, benefiting us all by modelling right relations.